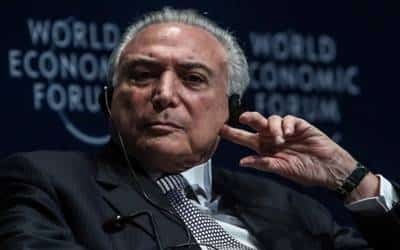 Rio De Janeiro, March 22 (IANS) Brazil’s former President Michel Temer was arrested on corruption charges, the media reported on Friday. The arrest on Thursday was ordered by Judge Marcelo Bretas, who is in charge of the Operation Car Wash investigations on corruption in the government, reported Xinhua news agency. Seven others were also arrested, including Moreira Franco, who served as the Minister of Mines and Energy in the Temer government and retired Colonel Joao Baptista Lima Filho, a close friend of Temer. The former President was mentioned in several different cases of corruption, but was arrested for a particular case of bribe-taking. He was accused of taking 1 million reals (about $262,000) in bribes from construction company Engevix, in exchange for favouring the company in a contract with nuclear power plant Angra 3. Franco and Lima were accused of having acted as middlemen in the case. Temer, the predecessor of current President Jair Bolsonaro, left office last year. He is the second Brazilian President to be arrested on corruption charges, following Luiz Inacio Lula da Silva, who is currently serving a 12-year-and-one-month prison sentence for corruption and money laundering.